A leading river researcher shares key information about the science behind the stewardship. Jim Almendinger is Senior Scientist at the St. Croix Watershed Research Station. This article provides highlights of a presentation Dr. Almendinger offered this past October as guest speaker for an event at Wild River State Park, co-hosted by the park and the Amador-Sunrise Registry of the Women’s Environmental Institute. He was kind enough to share his remarks with readers of St. Croix 360. So, how is the water quality in the St. Croix basin? The answer is as Minnesotan as it gets: “Been better. Could be worse.” The very question assumes that there is a standard against which water quality can be measured, a scale that goes from “nauseatingly slimy” to “crystalline pure,” with the St. Croix ranking “OK, all things considered.” This means, of course, that we have work to do. The Clean Water Act is administered by the U.S. Environmental Protection Agency (USEPA), also created under the Nixon administration, this time to its credit. However, the heavy lifting in carrying out the law is done by state agencies, which for the St. Croix basin means the Minnesota Pollution Control Agency and the Wisconsin Department of Natural Resources. The states are required to determine the maximum allowable pollution, i.e. the water-quality standard, which is usually stated in terms of a concentration of a pollutant. Above this standard, the waters are deemed no longer fishable and swimmable, and are thus impaired. Every two years, the states submit to the USEPA a list of all impaired waters, the so-called “303(d) list” in reference to the relevant section of the 1972 Clean Water Act. For each impaired water body (lake or stream segment) on the 303(d) list, the state is required to identify the cause of the problem and to determine the maximum amount, or “load,” of the causal pollutant that could enter the water without exceeding the standard. When calculated as a daily value, the quantity is called the “total maximum daily load,” or TMDL. Once the TMDL is established, the state then develops a plan on how to achieve it, that is, how to reduce pollutant loads down to or below the TMDL so that the water body will meet the water-quality standards and be taken off the impaired waters list. Note that the Clean Water Act does not aim to return waters to a pristine, natural state — only to that level where they meet usability standards. It is a compromise position that tolerates some level of pollution, but within selected limits. The Clean Water Act has been tremendously successful in reducing pollution from specific “point sources,” mostly industrial waste and municipal waste-water treatment plants. On both the Minnesota and Wisconsin side of the St. Croix River, improvements to waste-water treatment plant technology have drastically reduced waste loads during the 1990s and early 2000s. However, the major pollutant loads to the St. Croix have come from “nonpoint” sources, which are diffuse sources from urban and agricultural lands. Often carried in run-off, nonpoint-source pollution may include excess sediment that chokes waterways by siltation, and excess nutrients (phosphorus and nitrogen) that cause nuisance levels of algae. Nonpoint-source pollution from urban areas is gradually being addressed for larger municipalities. Still, the largest contributor to the St. Croix is agricultural land, because of the large areas of tilled, fertilized land exposed to erosion, which transfers topsoil and nutrients to receiving waters. Ironically, agricultural runoff is explicitly excluded from regulation under the Clean Water Act. In 2008, both Minnesota and Wisconsin declared that Lake St. Croix, the lowermost 25 miles of the St. Croix River, was impaired by excess phosphorus and resultant nuisance algal blooms. Lake St. Croix stretches from Stillwater, MN, to Prescott, WI, and is a natural impoundment created about 10,000 years ago as flow at its outlet was dammed by changes in sediment deposition and water levels at its confluence with the Mississippi River. Recent (1998-2006) phosphorus concentrations have averaged about 50 micrograms per liter (ug/L), which exceed the standard of 40 ug/L. This standard was arrived at from two different directions. First, it is the phosphorus concentration currently found in good-quality lakes in the “North-central hardwoods eco-region,” wherein lies Lake St. Croix and much of its watershed. Second, and more directly, it corresponds to historically good water quality in Lake St. Croix itself, which last occurred back in about the 1940s. But no one was measuring water quality back then — so how do we know? Figure 1. Transects where sediment cores (three per transect) were collected from Lake St. Croix in 1999-2000. We know because of lake sediment cores from the bottom of Lake St. Croix (Fig.1). Each year, the lake deposits another layer of sediment, and the composition of that sediment records the environmental history of the St. Croix basin, especially the water quality of the lake. Each slice of a sediment core is a snapshot of history, and the deeper into the mud, the farther back in time one can travel (Fig. 2). In the early 2000s, scientists from the St. Croix Watershed Research Station (principally Triplett, Edlund, and Engstrom) collected 24 sediment cores and analyzed the mud for its components, especially the fossil remains of diatoms, a type of algae very sensitive to phosphorus levels in the lake water (Fig. 3). Figure 3. 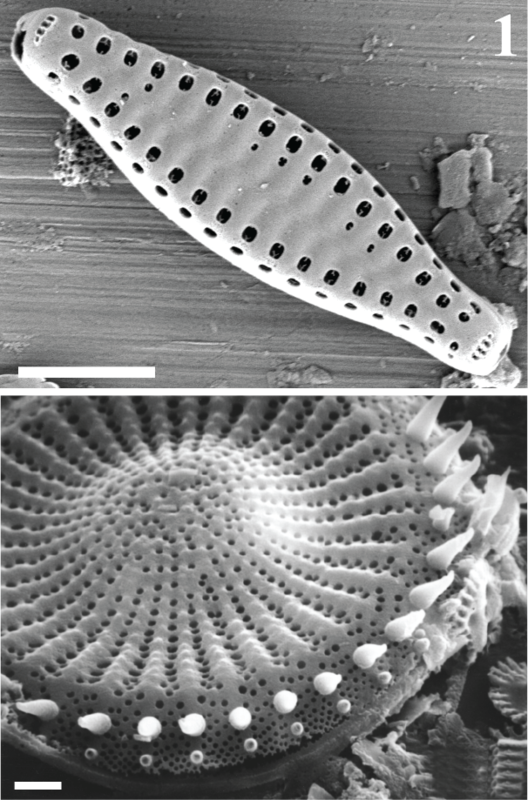 Diatoms are microscopic algae that are sensitive to water quality, and their intricate glass cell walls are preserved in the lake sediment (mud). Their record in the sediment thus provides a record of water quality. Diatoms grow either in the lake water as drifting plankton or on shallow rocks along the lake bottom, and when they die they sink to the bottom. The intricate silica (glass) cell walls of the diatoms are preserved in the mud and thus tell us what phosphorus levels were in the lake water at the time the mud was being deposited. The sediment cores for Lake St. Croix went back to before the time when European American settlers arrived and began cutting lumber, plowing the prairie, and building cities. The diatom remains tell us that the natural phosphorus levels in the St. Croix were about 15-20 ug/L, about a third of modern levels. And, the cores tell us that the last time the water averaged about 40 ug/L phosphorus (our standard) was in the 1940s, when the water was still clear enough so that bottom-dwelling diatoms were not shaded out by the phosphorus-loving planktonic diatoms. Without the lake cores, we really wouldn’t know what “natural” means for the St. Croix. With some assumptions about the flow volume in the St. Croix over the years, the phosphorus levels indicated by the diatoms can be converted into an estimated mass (tons) of phosphorus entering the lake each year (Fig. 2). The natural background load of phosphorus to Lake St. Croix was about 160 tons/year (blue bars, Fig.2); the loads increased from human sources (green bars) to about 360 tons/yr in the 1940s, and up to 460 tons/yr by the 1990s. So, to reach our goal of re-creating water-quality conditions in the 1940s, when the phosphorus concentrations matched our standard, we need to reduce the load of phosphorus to Lake St. Croix by about 100 tons/yr. To add a margin of safety, the state agencies have agreed to aim for a somewhat larger reduction of about 125 tons/yr. Our annual goal, then, is a 27% reduction in annual phosphorus load, from 460 down to about 335 tons/yr, our “total maximum annual load.” To match the language of the Clean Water Act, the annual load can be divided by 365 days per year to calculate the “total maximum daily load” (TMDL — see above) of about 0.92 tons/day. However, it is not feasible to measure daily loads in a system as large and complex as the St. Croix basin, and the annual load is a much more meaningful value. Figure 2. 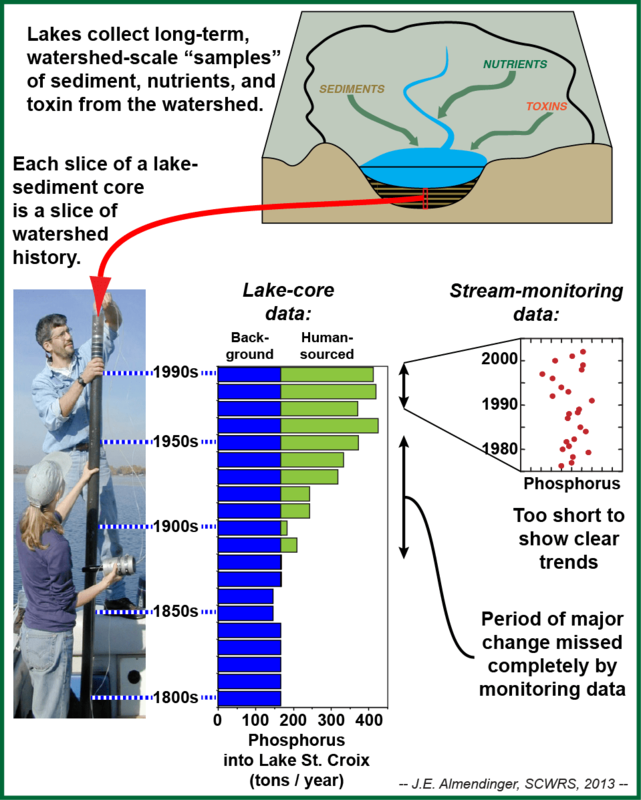 Diagram showing how lake sediments record watershed history, and how the sediment record of phosphorus loads to Lake St. Croix compares to more recent water-quality monitoring data. So how do we get there? How do we reduce phosphorus loads to the St. Croix River in general, and to Lake St. Croix in particular, by 27%? Improvements in point-source waste-water treatment plant technology have already provided some gains. But the rest will have to come from changes on the landscape to reduce nonpoint sources of pollution, especially from the agricultural sector, because it is the largest contributor. Field studies have indicated that certain farming practices, called “best management practices” (BMPs), could reduce phosphorus loads, but it remains unclear how much these efforts can help at the watershed scale of the St. Croix and its tributaries. One way of approximating the aggregate effect of BMPs is to use a computer simulation of watershed processes, to see how a multitude of small efforts across the landscape can add up to large results for the entire watershed (Fig. 4). Figure 4. 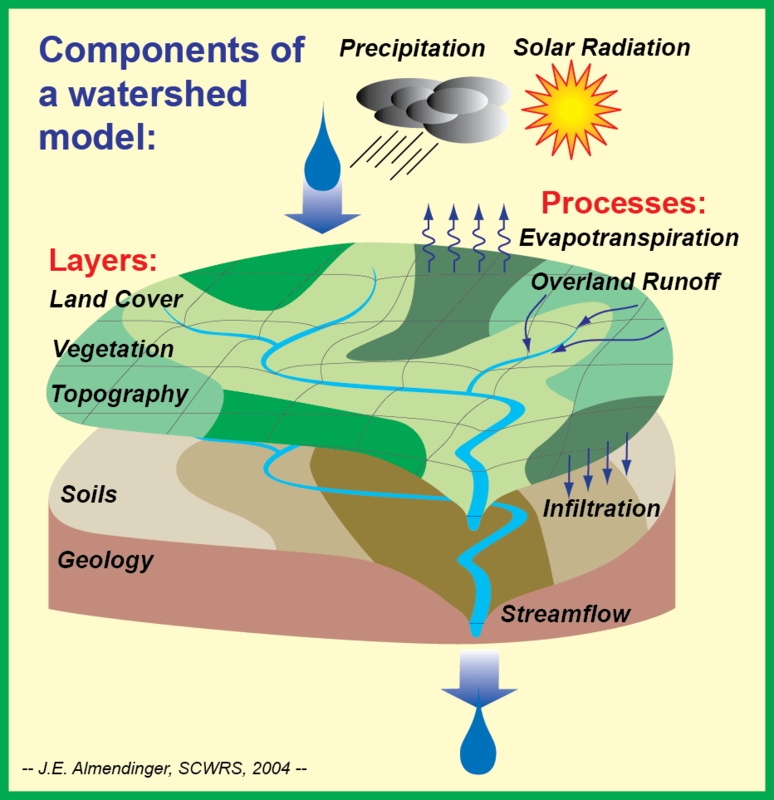 Watershed computer models simulate the processes that transport suspended and dissolved pollutants from the land to streams, rivers, and lakes. They can be used to estimate the impact of land-use change on water quality. 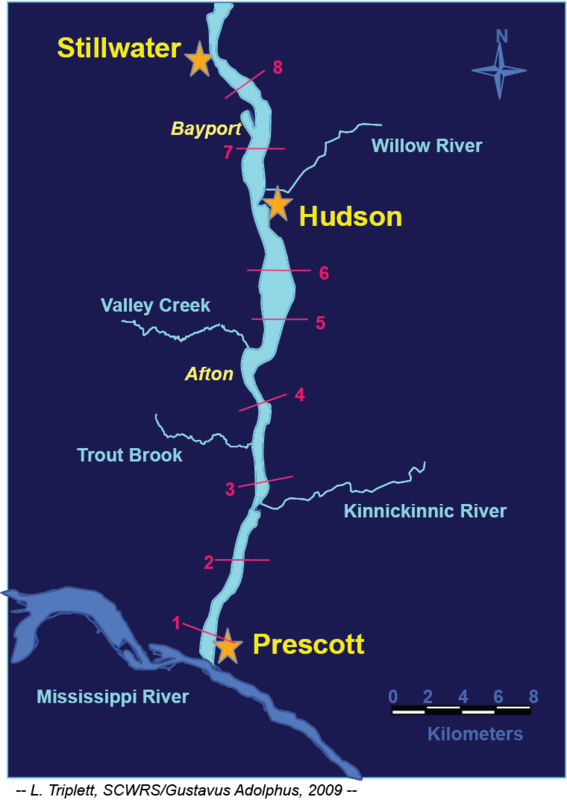 To this end, the St. Croix Watershed Research Station constructed a computer model of the Sunrise River watershed, one of the major tributaries to the St. Croix (Fig.5). The Sunrise has its own impaired-waters problems with too much phosphorus in its lakes, so cleaning up the Sunrise has the double benefit of improving local water quality there as well as protecting the St. Croix. We used the Soil and Water Assessment Tool (SWAT) program, which was created by the U.S. Department of Agriculture primarily for rural watershed analysis. The SWAT model of the Sunrise subdivided the watershed into 142 mini-watersheds and calculated runoff and nonpoint-source pollution from each one, while considering the vegetation, agricultural practices, soils, and slopes. Figure 5. 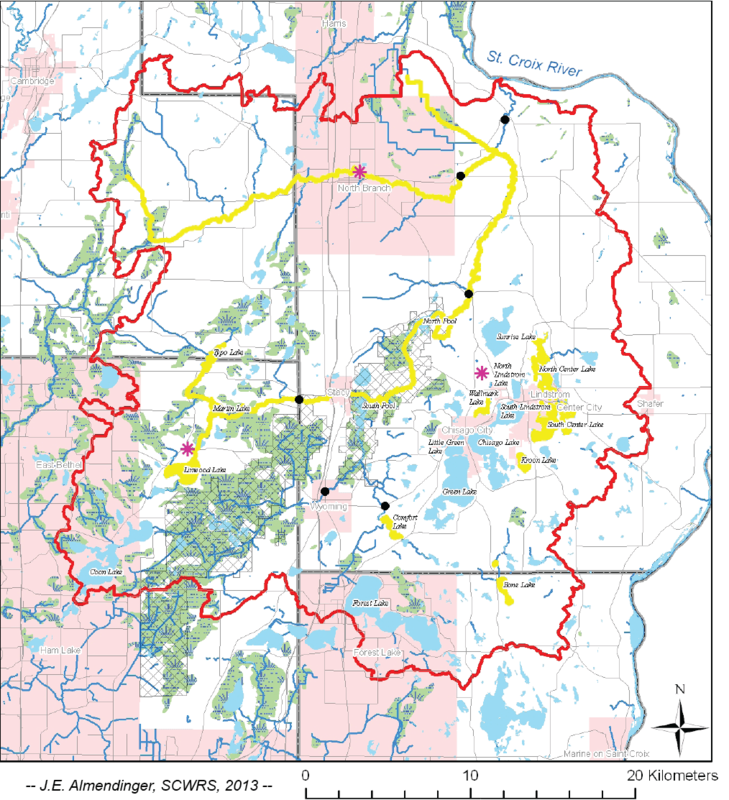 The watershed (red boundary) of the Sunrise River, a major tributary to the St. Croix on the Minnesota side, showing impaired waters (river segments and lakes) in yellow. Many of these impairments are related to excess phosphorus. Model results indicated that selected agricultural practices such as reduced tillage, reduced fertilizer applications, and construction of filter strips and grassed waterways could reduce phosphorus loads by up to 18% individually, and more than 20% in combination. In addition, restoration of wetlands that capture some upland runoff could likewise reduce phosphorus loads reaching river. However, continued population growth and urbanization around the Chisago-area chain of lakes may increase phosphorus loads by more than 10% to many of these lakes. On the other hand, the SWAT model was not very good at simulating the potential benefits of improved urban practices that limit runoff and thus reduce stormwater pollution, and hence the model results may be too pessimistic for these areas. So, in summary, the St. Croix has some problems with phosphorus pollution, but these problems appear to be fixable. Looking back in time to the sediment-core record, we see that the river ecology could be much improved if we can just reduce phosphorus loads back to about what they were in the 1940s. Looking forward in time with the watershed model, we see that selected land-use changes and agricultural best-management practices could reduce loads enough to reach this goal. There are also meaningful steps that all residents of the watershed can take. Rural residents should make sure their septic systems are in compliance. City dwellers should support stormwater infiltration projects and use rain barrels and rain gardens. Never put yard waste on streets, where it can wash into our lakes and rivers. All lawn fertilizer should be zero-phosphorus. Consider composting food waste for your gardens, rather than sending it down the drain to the treatment plant. However, there is no magic bullet that will singlehandedly fix the problem. It will take the concerted effort of many individuals and many different methods in order to produce an aggregate, watershed-wide reduction in phosphorus loads. Like many other large Midwestern watersheds, the St. Croix has suffered impairment (not yet death) by a thousand cuts. We should not be surprised if it takes a thousand band-aids to help repair the problem. Let’s hope that all the enjoyment and values that people gain from this National Wild and Scenic Riverway will translate into action on the river’s behalf.